Since 1987, Jarco Roofing & Solar has provided Canyon Lake and Menifee residents with a full range of roofing and solar services. We expertly install new and replacement roofs and solar panels on top of residential, commercial, and municipal structures. We also perform roof repairs, inspections, maintenance, and tuneups; clean solar panels, skylights, and gutters; and issue roof certifications for Canyon Lake and Menifee real estate transactions. Renowned for our high-quality work and fair rates, we've successfully grown our business over the last 28 years largely through client referrals and positive word-of-mouth. At Jarco Roofing & Solar, we hold ourselves to the highest standards. Our company meets and/or exceeds the requirements set by the National Roofing Contractors Association (NRCA), as well as all relevant city and county building codes. For residential and commercial new roof and reroof installations, we also comply with California's Title 24 "cool roof" energy codes. Additionally, as we are a full-service roofing company, we'll also take care of all permits and inspection arrangements on behalf of our Corona clients. Call us today. Our hours are Monday-Friday, from 7 a.m.-4 p.m.. Jarco Roofing & Solar is licensed, bonded, and insured. 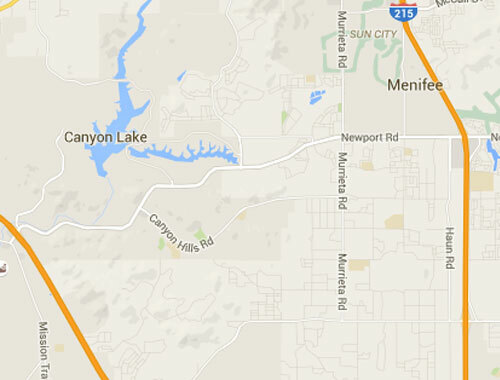 We offer free on-site job estimates in Canyon Lake, Menifee, and surrounding areas. With almost thirty years of experience in the roofing industry, we've worked on every kind of roof and with every kind of roofing material, including tile, composition shingle, slate, and flat. Our employees are all highly experienced, and we take great pride in our careful, thorough, and competitively priced services. We also offer discounts for seniors. These manufacturers produce high-quality, durable roofing materials in a wide array of styles and colors. Our brand-name roofing materials come with excellent manufacturer warranties and are available very fair rates. Call today to tell us about your new roof or re-roof goals in Canyon Lake and Menifee. We'll work closely with you to ensure your roofing needs are met. Jarco Roofing & Solar is your one call for roof repairs in Canyon Lake, Menifee, Wildomar, and surrounding cities. We repair roofing damage caused by water leaks, dry rot, crumbling mortar, broken tiles, termites/animals, extreme weather, time, and more. Our experts will carefully inspect your Menifee roof to assess the damage and how best to repair it. We provide free estimates for all roof repair work, and our goal is to provide you an honest list of solutions based on your individual needs. Jarco Roofing & Solar does everything from small repairs to full re-roofs. We even offer roof reconditioning for commercial flat roof systems, where we'll extend the life of your old roof for another 10 to 20 years with a self-adhering application of polyester applied emulsion. To help you consider your roof repair options, we'll provide upfront price estimates and discuss the pros and cons of your various options. Call today. Jarco Roofing & Solar promises superior roof repair service at highly competitive rates. At Jarco Roofing & Solar, we always remind our Canyon Lake customers to schedule regular roof maintenance and tune-up appointments. It's an easy, preventive measure that can help maximize your roof's life and catch small problems before they become big ones. During our tune-up service, we thoroughly inspect your entire roof system. Our expert checks your roof for leaks, termites, dry rot, missing tiles, and other damage. We'll reseal any penetrations we find, and check carefully around venting, piping, and your fireplace. We also check your roof's flashing and perform reseal work if necessary. We can also clean your roof, gutters, solar panels, and skylights as part of your tune-up or as a standalone service. Call Jarco Roofing & Solar today to schedule your roof tune-up and/or cleaning in Canyon Lake, Menifee, and Wildomar. It's an easy, low-cost job that can potentially save you money in the long run. Canyon Lake and Menifee homeowners are sometimes required to provide roof certifications when selling their homes. A roof certification acts as a warranty against water leaks and damage and can be issued for a one-, two- or three-year time period. To get your roof certified, call Jarco Roofing & Solar today to schedule an inspection and certification. These certifications are typically performed prior to the close of escrow, and can be initiated by the seller, buyer, or real estate company managing the transaction. Apart from real estate-related roof certifications, our company also performs general inspections in Canyon Lake, Wildomar, and surrounding cities, where we'll evaluate your roof's tightness, drainage, overall condition, and estimated remaining life. We can also check the underlayment upon request. These inspections are complimentary, though we do charge a small fee for written inspections. For professional solar installation, Menifee homeowners can always count on Jarco Roofing & Solar for superior work, reliable service, and fair rates. Our company works with the industry's leading solar panels brands: Solar World, Hyundai, Canadian Solar, QCell, and Trina. Having worked extensively with these brands over the years, we're confident in the quality, performance, and durability of their solar panel systems. Moreover, our preferred manufacturers typically back their solar panels with 20-year warranties. While having a quality solar panel system is important, you can't forget about the expertise of your solar panel installer. Because solar panels are attached to your roof and are intended to remain there for decades, you'll want to find an installer who understands roofs. At Jarco Roofing & Solar, we know not only how to help you maximize your energy savings, but also how to install solar panels so they don't damage the integrity or functionality of your roofing system. Our roof penetrations are warrantied for a full ten years; but, unlike some solar companies, you can rest assured that we will still be here ten years from now to stand behind that warranty, if you need us. We've been serving the Canyon Lake area for almost thirty years and have a reputation for excellent workmanship. We'll make sure your solar installation is done right, the first time, and within a timely manner. Jarco Roofing & Solar is registered with the HERO program, and we always inform our Canyon Lake and Menifee customers on all of the latest federal, state, and local solar programs, tax credits, and rebates. You can choose to buy the panels or lease them, and we're happy to work with you to determine which option would best suit your needs. Ask us about our various solar panel financing options.